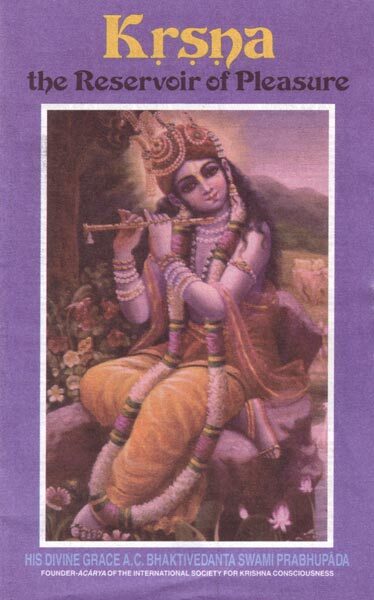 Krishna—this sound is transcendental. Krishna means the highest pleasure. All of us, every living being, seeks pleasure. But we do not know how to seek pleasure perfectly. With a materialistic concept of life, we are frustrated at every step in satisfying our pleasure because we have no information regarding the real level on which to have real pleasure. For the last few weeks we have been learning that we are not this body; we are consciousness. Not exactly consciousness, for consciousness is actually the symptom of our real identity: we are pure soul, now merged within this material body. Modern material science lays no stress on this; therefore the scientists are sometimes misled in their understanding of spirit soul. But spirit soul is a fact, which anyone can understand by the presence of consciousness. Any child can understand that consciousness is the symptom of the spirit soul. Even after the destruction of this body, consciousness is not destroyed. Rather, consciousness is transferred to another type of body and again makes us aware of the material conception of life. That is also described in the Bhagavad-gita. At the time of death, if our consciousness is pure, we can be sure that our next life will not be material—our next life will be spiritual. If our consciousness is not pure at the point of death, then, after leaving this body, we shall have to take another material body. That is the process which is going on. That is Nature's law. The International Society for Krishna Consciousness is simply intended to keep us in constant touch with Krishna. Krishna can be in constant companionship with us because He is omnipotent. Therefore, He can be fully in touch with us by His words. His words and He are not different. That is omnipotence. Omnipotence means that everything relating to Him has the same potency. For example, here in this material world, if we are thirsty and we want water, simply repeating “Water, water, water, water,” will not satisfy our thirst, because this word has not the same potency as water itself. We require the water in substance. Then our thirst will be satisfied. But in the transcendental, absolute world, there is no such difference. Krishna's name, Krishna's quality, Krishna's word—everything is Krishna and provides the same satisfaction. Some people argue that Arjuna was talking with Krishna because Krishna was present before him, whereas in my case, Krishna is not present. So how can I get directions? But that is not a fact. Krishna is present by His words—the Bhagavad-gita. In India, when we speak on the Bhagavad-gita or Srimad-Bhagavatam, we regularly perform worship with flowers, or with other paraphernalia, as is required for worshiping. In the Sikh religion also, although they have no form of the Deity, they worship the book Granthasahib. Perhaps some of you are acquainted with this Sikh community. They worship this Grantha. Similarly, the Moslems worship the Koran. Similarly, in the Christian world, the Bible is worshiped. It is a fact that the Lord Jesus Christ is present by His words. Krishna is also present by His words.